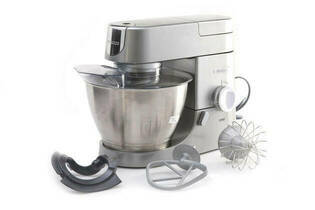 Snapshot: The Kenwood KVC3100S/W has a 4.6L bowl and comes with a whisk and a scraper beater. How well does it beat, mix and knead? Good for ease of use. Splash guard and pouring shield supplied. Beater height is adjustable using a tool supplied. Mixing bowl does not have a handle. When locking and removing mixing bowl, the unit can slide, no suction to stabilise the unit. No eject button to remove beater, twist and unlock from position, hand can get covered in mixture. Exterior has many cracks and crevices where dirt can accumulate. Price is from a January 2019 survey. Dimensions are measured with the mixer standing on its base.